Roadburn HQ have become obsessed with The Cult of Dom Keller‘s druggy bliss lately, as the Nothingham (UK) four piece channels the lysergic spirits of 13th Floor Elevators, Stooges, Black Sabbath, Spaceman 3 and Acid Mothers Temple into full blown, third-eye transcendentalism. You can almost hear the trippy, kaleidoscopic flashbacks through hazy clouds of obscurity, flashing strobes and glowing smoke through the band’s chemical feast of fuzzy, psychedelic madness, part shimmering feedback explorations, swamp-infested blues bastardizations, and part mind expanding stoner rock manipulations. 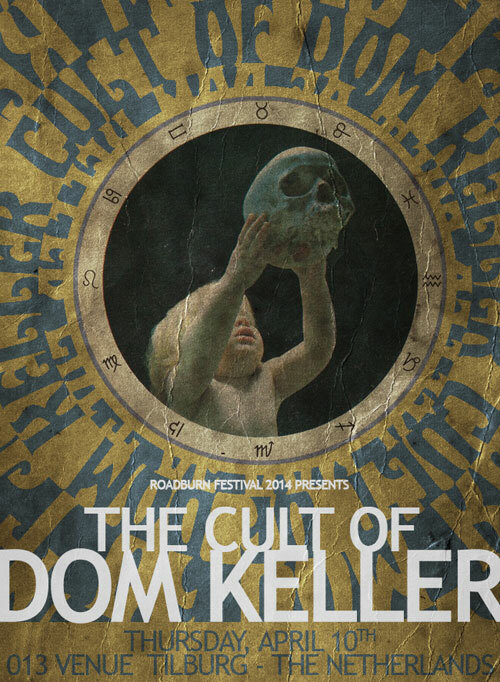 The Cult of Dom Keller will document our delirious, collective hallucinations by gathering on Thursday, April 10th at the 013 venue in Tilburg, The Netherlands, and the band’s captivating, tranced out sounds will definitely echo through the deepest valleys of your mind. In case you simply can’t wait until Roadburn to get your mind blown, or simply need a dirty slab of bludgeoning psychedelica, there’s always The Cult of Dom Keller‘s self-titled debut album to get your fix! Hear for yourself why the band ranks among the coolest psychonauts this side of The Black Angels and Brian Jonestown Massacre.